To determine if and to what degree legacy environmental conditions posed a regulatory and/or business risk to an acquiring party of a commercial property. Brownfield Science & Technology, Inc. (BSTI) was retained by a private equity firm to evaluate and define possible environmental regulatory and business risks associated with their contemplated foreclosure on a commercial property in East Brunswick, NJ. At project inception, no environmental conditions were known to exist at the eight-acre retail shopping center. However, BSTI identified that the property had previously been a pesticide/herbicide manufacturing facility prior to redevelopment in 1987. New Jersey Department of Environmental Protection (NJDEP) files pertaining to this facility were disjointed and available only on microfilm. Nevertheless, BSTI was able to efficiently obtain and extract the most pertinent documents out of the 3,000 files on record. Extensive soil and groundwater assessment at the former pesticide/herbicide facility identified several chemicals in soil that required remediation by excavation. Residual post -excavation concentrations of those chemicals were deemed acceptable by the NJDEP and the site received No Further Action status in 1986. Based on a straight interpretation of the chemicals left in place, the No Further Action status appeared vulnerable because the residual concentrations did not satisfy NJDEP’s current, more stringent standards. 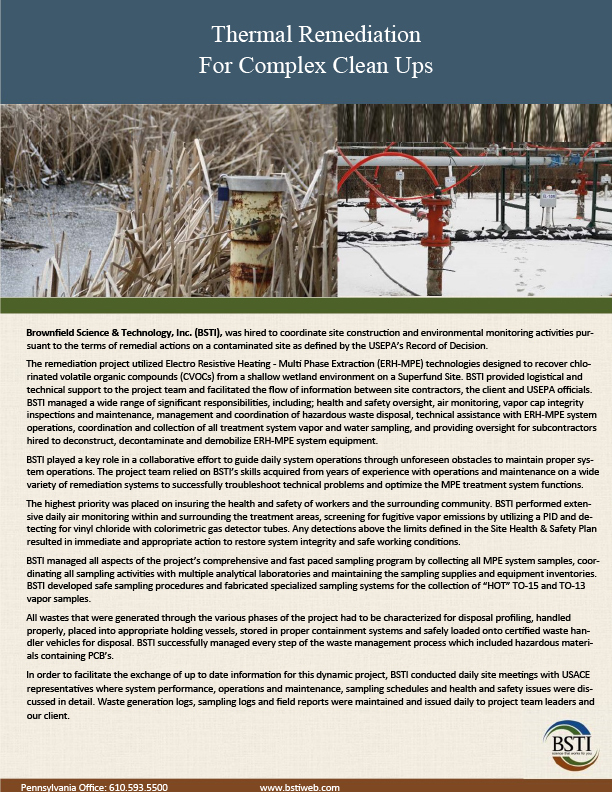 BSTI’s knowledge of NJDEP policy identified a 2009 document titled “NJDEP Order of Magnitude Guidance” was the key to directly addressing and mitigating the possibility of a regulatory reopener event; the most significant risk factor facing our client. BSTI was able to define the remaining, less significant risk factors within a context that was understood and therefore manageable to our client. Our client subsequently moved forward with their intended plans for the property.